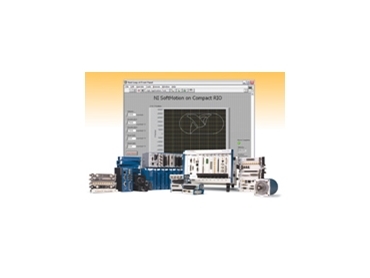 National Instruments has released the latest version of the NI SoftMotion Development Module for LabVIEW, the software that empowers machine builders and original equipment manufacturers (OEMs) to create customized motion controllers using software and deploy them for any NI hardware platform. OEMs and machine builders can use a range of pre-built motion functions and control algorithms to quickly create motion controllers based on specific application requirements as well as price and performance needs. The new NI SoftMotion Development Module 2.0 expands this flexible environment to stepper motor control and adds support for the Windows Vista OS and new National Instruments CompactRIO controllers for high-performance motion control. The NI SoftMotion Development Module provides a new way for designers to create the best control system for their applications, resulting in a more efficient machine without the overhead of a custom layout. The NI SoftMotion Development Module is ideal for applications that require high-speed or custom control such as drilling, semiconductor processes, micro electromechanical system processes (MEMS) and in-line vehicle sequencing by automakers. Machine builders and OEMs can use the NI SoftMotion Development Module to easily create custom motion controllers with advanced control algorithms such as fuzzy logic or model-based control for better machine performance. Combined with the NI LabVIEW FPGA technology in NI CompactRIO modules and NI R Series data acquisition devices, they implement PID loop rates of up to 200 kHz. With these faster loop rates, researchers gain more precise control to build finer materials. They can also adapt more quickly to changes, leading to more efficient machines. Researchers can use the NI SoftMotion Development Module to quickly develop and prototype new control design algorithms for motion control. The software includes functions for trajectory generation, spline interpolation, position and velocity PID control and encoder implementation on the LabVIEW Real-Time Module and/or the LabVIEW FPGA Module. Using these functions, researchers can experiment with the range of available algorithms to fine-tune their applications and even create their own. With the NI SoftMotion Development Module, engineers can create custom motion controllers using the platform of their choice, including the CompactRIO embedded platform, plug-in NI M Series and R Series data acquisition devices, or the NI Compact FieldPoint programmable automation controller, depending on performance requirements. The latest version of the NI SoftMotion Development Module adds support for its spline engine function to generate step data output as well as a new stepper generator function to process step data into step and direction signals for a stepper motor, giving machine builders the ability to choose the motor best suited for their applications. In addition, it includes two new data types for spline data – fixed point and floating point. These data types give machine builders the flexibility to choose more loop rate combinations when using servo motors, which they can use to fine-tune their motion controllers for higher-performance control.